The following slides were taken by local photographer Leon M Blakeslee of Castile New York during the construction of the Mt. 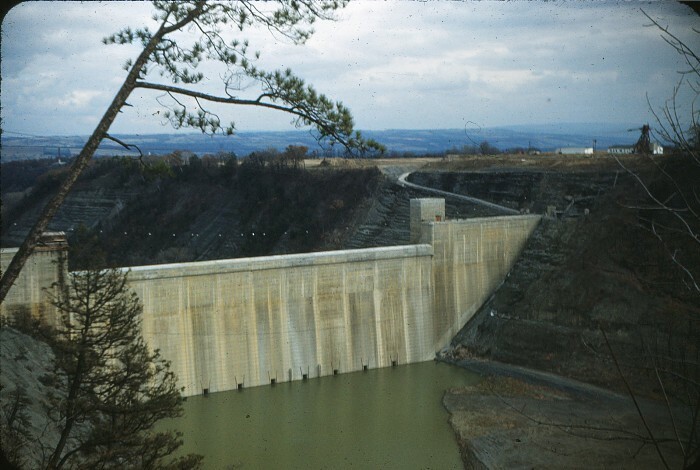 Morris Dam. We thank Mr. Clair "Dub" Swyers for sharing these images with us. 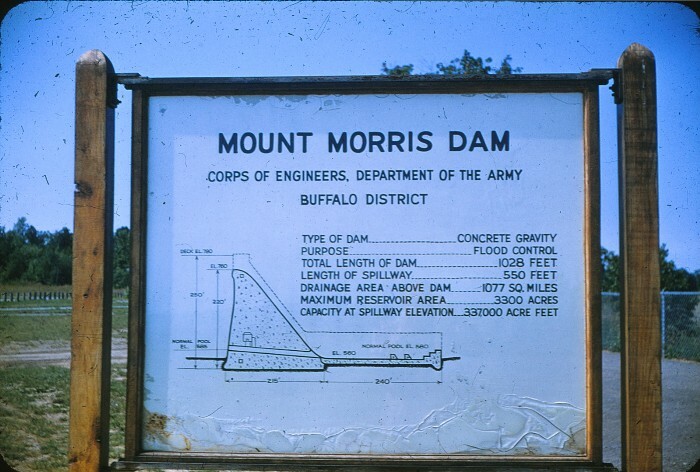 This sign was erected at the top of the gorge to show provide the public with basic understanding of the dam. Like most of the slides, this was undated, but was probably taken by Mr. Blakeslee on one of his visits to the construction site. The work, which started in in March of 1948, was well underway when this slide was taken. On the back is "F 49" which probably stands for February of 1949 since some snow and ice are visible. 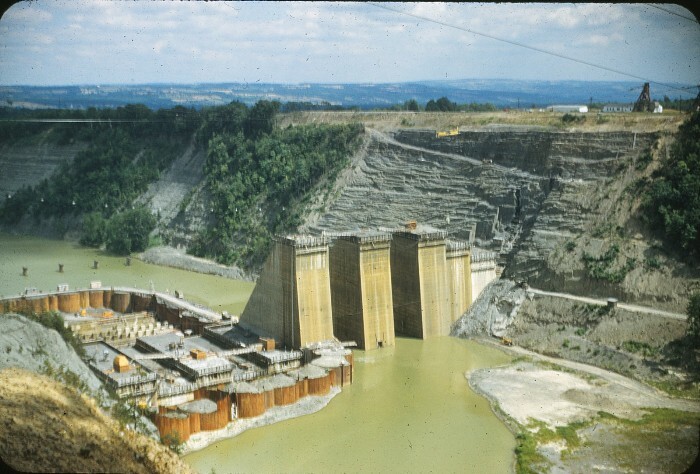 Four blocks on the south side of the future dam have taken shape and a coffer dam has been erected to allow workers to begin work on the northern blocks. blocks. When completed, each block will be well over 200 feet high. This view and the one that follows may have been taken later in 1949. The south blocks continue to rise while additional blocks begin to take shape within the coffer dam. 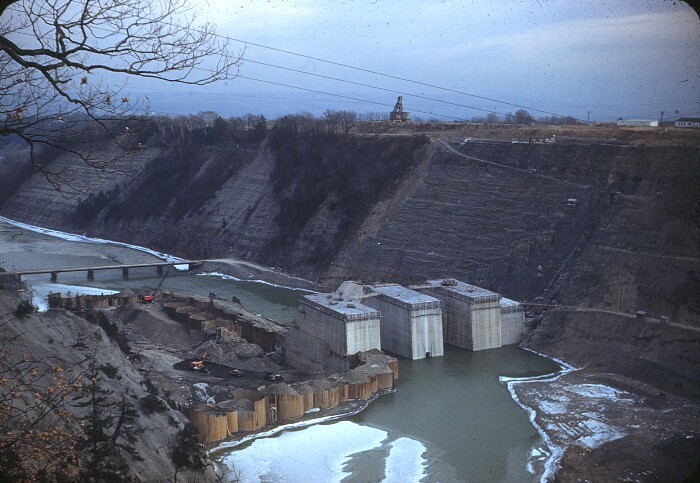 To the left, near the top of the bank, you can see the huge cement bucket that was used to carry 22 tons of cement at a time to the proper location. Each pour on a tour would add another four or five feet. It appears that Mr. Blakeslee took this slide during the same visit. 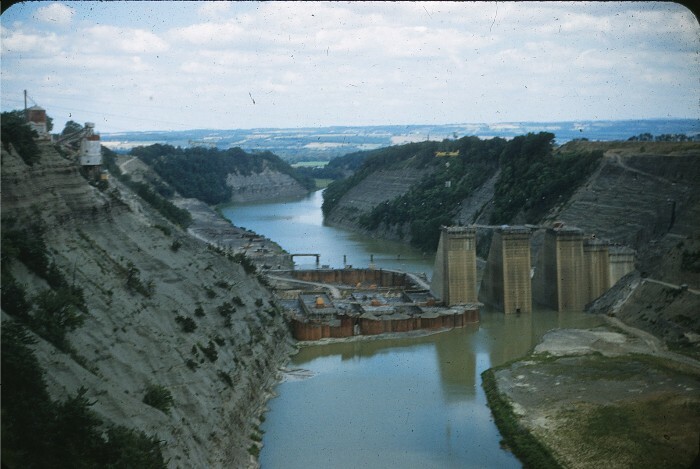 The area on the far right at the top of the gorge will later become the Army Corp of Engineer's workshops, house, and visitor center.This view and the one that follows may have been taken later in 1949. You can clearly see the giant cement bucket on its way to the next pour. Also note that the temporary bridge downstream from the dam has been dismantled, and that the river is now flowing through the conduits, permitting work on all the block sections. 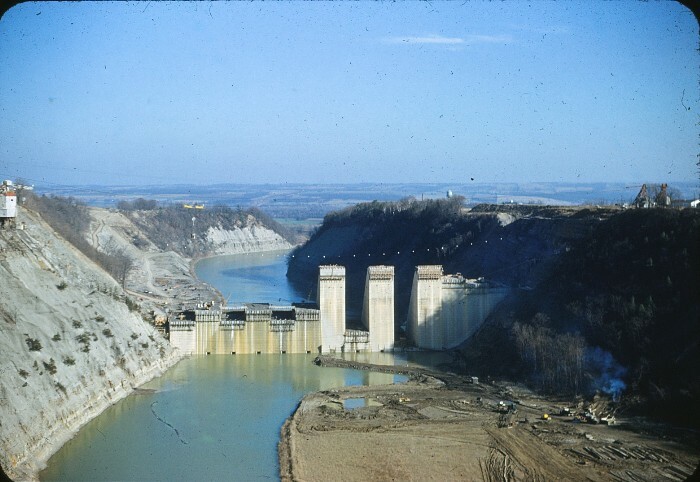 The remains of the last coffer dam can still be seen, however. This photograph was taken at a different angle then the one above. The date is not given, perhaps 1950 or early 1951. 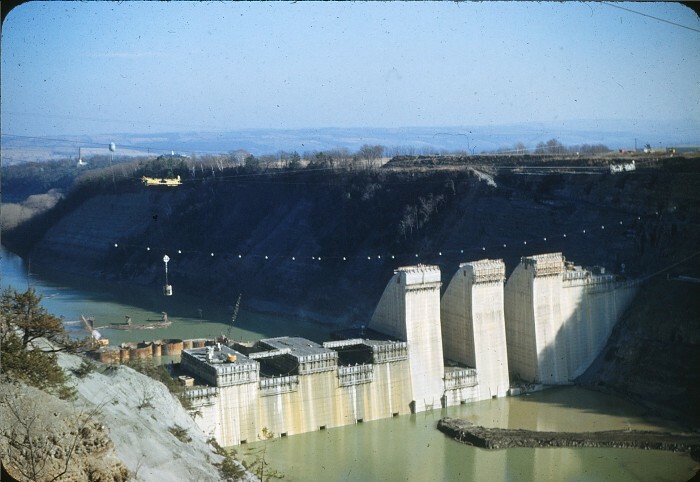 The dam is well on its way to completion in this slide. The actual work was finished in May of 1952. 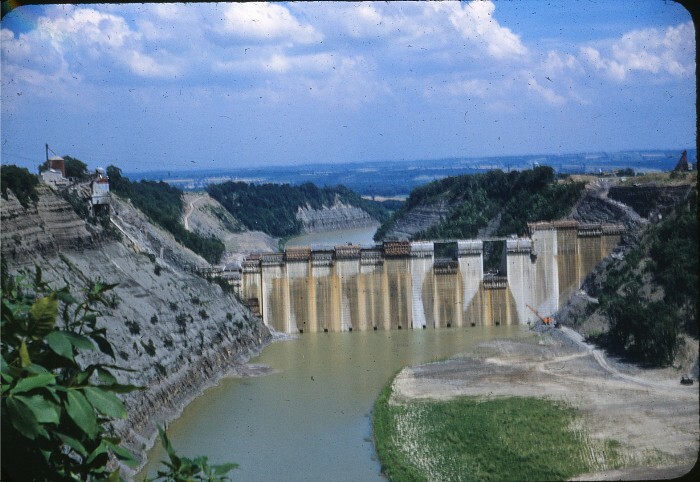 This view was taken after the dam was completed in May of 1952.